With the end of Summer almost upon us, what better way to prepare for Fall than the time honored tradition of taking on a whole bunch of new TV shows? You know how you feel? Summer is a free wheelin' good time for all of us. However, everybody needs some form of structure and these upcoming Fall TV shows will give you just that! And with the offerings so numerous, it wouldn't be prudent of us not to help guide you in your viewing endeavors. That, my friends, is exactly what this list aims to do. And with the help of TV Guide, we were able to narrow your DVR hopefuls to the twenty-two biggest shows you simply can't miss in the upcoming months. Whether you are looking for laughs, serious drama, procedurals or just mindless entertainment, the networks do not disappoint this year. With TV now maturing as the place to make content that we can't get from the movies, it honestly seems like the networks have gotten on board. They have stacked this list with shows that will make you think, make you laugh, make you question, and hopefully make you want more. The coolest part about all of this is the amount of new and familiar faces we are getting with these offerings. Whether it's Anne Heche in The Brave, or Craig Robinson and Adam Scott teaming up in Ghosted, or new/old blood like the cast of Seal Team, everything about the new 2017 Fall TV shows seems special. And all the big networks, from ABC, to CBS, to NBC, to Fox, along with The CW and all the biggest and best cable channels have at least one good show to offer up this year. TV is a very interesting medium. It has exploded because of it's constructs. Stories that have languished for years can now be told. And we, the viewing audience are the lucky recipients. However, not every show is worth your viewing time and we have taken it upon ourselves to help you out. 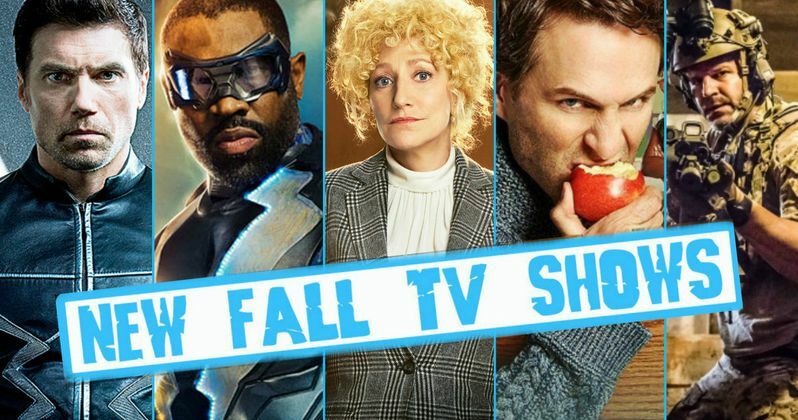 We stringently went through all the upcoming Fall TV shows and whittled them down to the 22 you need to check out. So sit back, take some shade and enjoy the New Fall TV Shows You Need to See. There is nothing but strong offerings here. In fact, even the pickiest of TV snobs would have to agree that this line-up is pretty darn great! An X-Men TV series? Count us in. The Gifted focuses on a suburban couple whose ordinary lives are rocked by the sudden discovery that their children possess mutant powers. Forced to go on the run from a hostile government, the family joins up with an underground network of mutants and must fight to survive. Everybody doesn't like somebody but nobody doesn't like the X-Men, right? If this show doesn't immediately captivate audiences, that will be the biggest surprise of the 2017 Fall TV season. You've gotta love a Star Trek tale that takes things all the way back to the beginning. This new show comes in before Captain Kirk and Mr. Spock ever had any sort of intergalactic meeting. We follow the crew of the Starfleet as they find themselves on new adventures week in and week out. With a cast that includes Michelle Yeoh, Rainn Wilson and the complex Jason Isaacs, Star Trek: Discovery already has fans old and new salivating. Where might the crew members of the Starfleet end up? How will Star Trek: Discovery comment on the issues that we face in today's world? The 1963 show set the standard and showed that no issue was off limits. It seems that Star Trek: Discovery, which takes place before the original show, will further invoke the vision of series creator Gene Roddenberry. The world needs many things and this prequel to The Big Bang Theory gives us a lot more Sheldon Cooper. If this was a social media post, I don't think I could LIKE it enough. For 9-year-old Sheldon Cooper (Iain Armitage), it isn't easy growing up in East Texas. Being a once-in-a-generation mind capable of advanced mathematics and science isn't always helpful in a land where church and football are king. And while the vulnerable, gifted and somewhat naïve Sheldon deals with the world, his very normal family must find a way to deal with him. The Big Bang Theory's multiple Emmy Award winner Jim Parsons narrates as Adult Sheldon. This single-camera, half-hour comedy gives us the chance to meet Sheldon in childhood, as he embarks on his innocent, awkward and hopeful journey toward the man he will become. Roseanne and Dan are back in all-new episodes of the 90's era sitcom that changed the face of TV forever. And don't worry. These latest half hour outings will basically ignore the series finale, which revealed Dan (Goodman) had died of a heart attack. Chalke, who played Becky after Goranson left the original series, will play a different character. And everyone else is back doing what they do best. No plot details have been revealed just yet, but Roseanne has been teasing this one for a long time. And it should satisfy those fans who want to revisit the Connor household. This is one of the most anticipated shows of the new fall season. Speaking of anticipated returns. We have Will, Grace, Just Jack and Karen all back for some big post-election episodes. Eleven years after going off the air, the former Must-See TV staple will return for a whole lot of fun, in a landscape that has changed drastically from the last time we caught up with the gang. NBC has so much confidence in these new Will & Grace episodes that Season 2 has already been renewed. This one should be super fun. Does The Gifted Exist in the X-Men Movie Universe?